He was born into a religious family in Gambellara, Italy, on 11 January 1803, as the second of five brothers. After the premature death of his father, Fr Antonio, his uncle, took the family into his home. This priest was his spiritual and intellectual mentor. 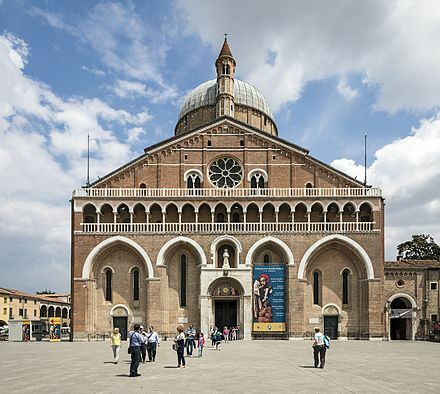 When he was 15 he entered the diocesan seminary of Vicenza where at 21 he was asked to begin teaching. On 15 January 1827, he was ordained priest and immediately afterwards earned an elementary school teacher’s diploma. On account of his pedagogical gifts, he was appointed as teacher and spiritual director at the seminary where he served for 18 years. He was assistant pastor at St Peter’s Parish for 10 years and headmaster in elementary and secondary schools in Vicenza. 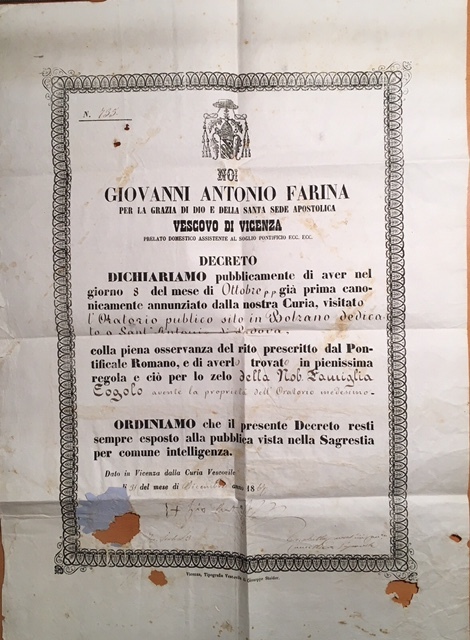 The document is a decree issued and signed by Bishop Farina honoring the Ergolo family who donated a statue of St. Anthony to the Capuchin church in Bolzano. The decree was to be posted for all to see in thanksgiving for so generous a gift. It appears this same family owned the land upon which the Oratorio was built. We declare publicly to have on the day, 8th October, as already announced in our Curia, visited the Oratorio, the public site in Bolzano consecrated to Saint Antony of Padua, observing fully the prescribed rite of the Roman Pontificate, and to have found it to be the most satisfying gift and this, through the zeal of the noble Family Eogolo, having the property of the same Oratorio. We order that this decree always be kept displayed for the public in the sacristy for general knowledge. 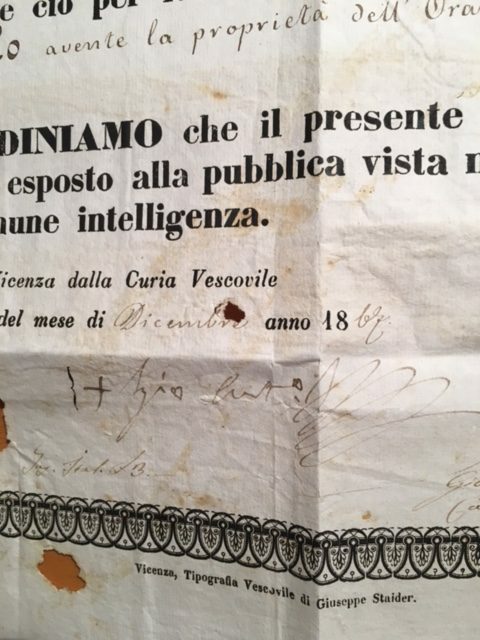 In 1831 in Vicenza he founded the first school for poor girls and in 1836, the Institute of the Sisters Teachers of St Dorothy, Daughters of the Sacred Hearts, to supply suitable teachers. He wanted his religious also to care for deaf mutes, blind girls and the psychologically handicapped. They nursed the sick and the elderly in hospital and at home. There was no form of suffering that this farsighted founder overlooked. In 1850 Fr Farina was appointed Bishop of Treviso. Here he undertook a variety of pastoral initiatives, forming his priests and laity for evangelization and Catholic Action. Throughout his ten-year term, canonical problems with the Cathedral Chapter caused him constant suffering and setbacks. Here he was able to follow the preparation of Giuseppe Sarto (the future St Pius X) for the priesthood ordaining him in 1858. In 1860 he was transferred to Vicenza. 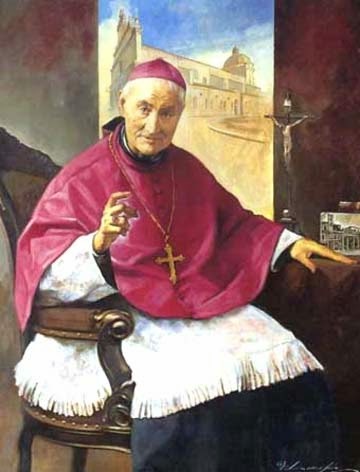 Despite the turbulent period in Italian history, during his 28 years as bishop he embarked on an ambitious pastoral programs that included the spiritual and cultural formation of the priests and of the laity for evangelization, the reform of studies and discipline in the seminary, and the organization of associations for the care of the poor. He was called the “Bishop of Charity”. In 1889 he was able to hold a diocesan synod. He was devoted to pastoral visits and visited every parish, even those that had never seen a bishop. His strength ebbed after a serious illness in 1886, and he died from a stroke in Vicenza on March 4, 1888. His compassionate treatment of the poor and his enlightened views on teachers and education make Bishop Farina one of the more outstanding bishops of the 19th century. Today, the institute he founded is involved in education as well as health care and pastoral assistance in many countries.